Database Systems Corp. (DSC) is a leading provider of computer telephony solutions including auto dialers plus predictive dialing software and systems. 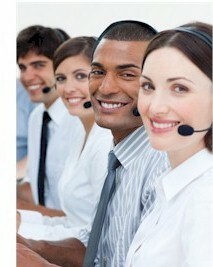 Our Predictive dialing software and phone systems process phone calls for outbound call centers. A predictive dialing system places outbound calls and transfers a call to an agent whenever a person answers the call. Predictive dialing saves money and time because it can eliminate calls that are unanswered such as busy signals, answering machines, no answer, and bad phone numbers. Predictive dialing technology translates into direct savings, either by allowing your call center to handle more calls per day with the same number of employees, or by allowing you to reduce your staff significantly while handling the same call volume. DSC phone systems perform traditional dialing as well as predictive dialing. But with its enhanced features and flexibility, our predictive dialers also support Smart Predictive Dialing. Contact DSC to learn more about our predictive dialing software and phone systems. Predictive dialing software performs many tasks. Essential to a predictive dialer system is a list manager that organizes phone lists into demographically related groups and passes these phone numbers to the actual dialer. The predictive dialer phone system is managed by proprietary pacing algorithm that uses many factors in determining how many phone numbers should be dialed to keep a specific number of agents busy, while avoiding calling too many numbers. DSC offers both affordable and expandable predictive dialer systems. These call center phone systems include a modern Windows PC with Dialogic computer telephony cards. When combined with our extensive IVR software, these phone systems can perform both inbound call answering functions as well as many different types of outbound calling campaigns. The WIZARD phone system is our entry level call center phone system that supports up to 48 analog phone lines. If your predictive dialer calling center requires more lines, our PACER auto dialing system can be used to deliver outbound phone calls over hundreds of digital phone lines. 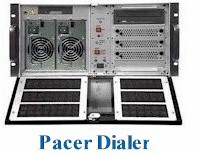 Contact DSC for a FREE analysis and quote and to learn more about our PACER and WIZARD predictive dialing systems.